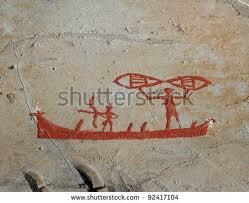 The mysterious objects drawn in the rock art turned out to be 'sails'. I put a questin about the objects which were held by the hands of the right figure in Stone humans drawn on the rock art on parade. I was happy enough to get the answer from Miss Taeko Shiraki. She asked the atoms from the sky about it and told me the oval objects which are held by the right figure played the role of the sails. Oh, they are sails for the ship, aren't they? I was satisfied with the explanation. If such small objects play the role of sails, the ship might not float on the water but it might float in the air. The long and short of it the ship did not advance on the water but it moved in the air. You can see the images of Masuda rock ship in Nara and Kyoto of Japan. When we see the shape of the ship, we are apt to imagine it floats on the water. However in ancient times even rocks floated in the air, because the atoms have consciousness and they loosened the hand to each other and floated up in the air. The oval sails might be ordered to expand or reduce by the direction of the Stone humans. When strong wind blew, it might be ordered to become smaller and when the wind got weakened, it might be ordered to become bigger. After all, if you can order "please become a form of something" to atoms by talking to atoms, they might be able to do anything by the way like magic. As Stone gods and Stone humans were able to make human beings, they could have drawn more accurate images, if they had wanted to draw rock arts. The rock arts which have remained until now might have been drawn for the textbook for the newly born human beings who were made in the stone circles at that time. As they were born suddenly in this world, they had no wisdom for their living. Therefore a kind of textbooks must have been needed for the newly born human beings. 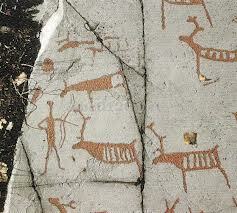 When we see those rock arts with such thoughts, we can find some of the rock arts which depict the scene of the hunting. Or they might be the directive which tell the atoms all over the world so that they could learn what type of Stone humans or the creatures to become. The representative of directive may be the Nazca Lines. However if Stone humans drew too accurate rock art, the Ruler's Stars would have extinguished them thoroughly. Perhaps, detailed pictures that may have existed in the past have been completely out of the ground now. 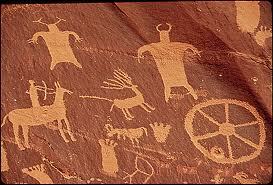 I found a cryptic rock art when I was looking for the Stone humans depicted in the rock arts. The right figure who is on the ship lift strange things by hand. What are those things which are lifted up by the figure? We would not know the answer if we did not ask to Ms Taeko Shiraki. I remember the question about the strange rock art in Fugoppe cave which I asked to Ms Taeko Shiraki previously. She told me it is the clothes stand for drying the fish. 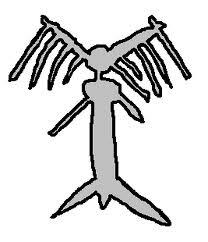 The answer of Ms Taeko Shiraki about "What on earth are the things like the feather or antenna which extends from side to side around the head or shoulders of Stone men carved in Fugoppe cave in Hokkaido, Japan?" At first I thought they are the feathers of angels. However I got the surprising answer from the atoms from the sky. When I saw the rock art at that time I was told through the channeling, feather-like things are showing the things with which Stone humans dried and preserved fish. However there are cases with various meaning and the atoms from the sky may tell me another information later. Channeling information tells me now the upper image shows the Stone human who was carrying animals on the shoulder or carrying skewered fish. However I was told the below image doesn't show the Stone human. That is the clothes stand (?) with which they dried the fish. For now is the answer for the time being. After reading the above answer of Ms Taeko Shiraki, I think the things which are held in the hands of the right figure may be the tools for catching the fish. Or they are a kind of the celestial raiment and the figure might float up in the air with the power of it? ?